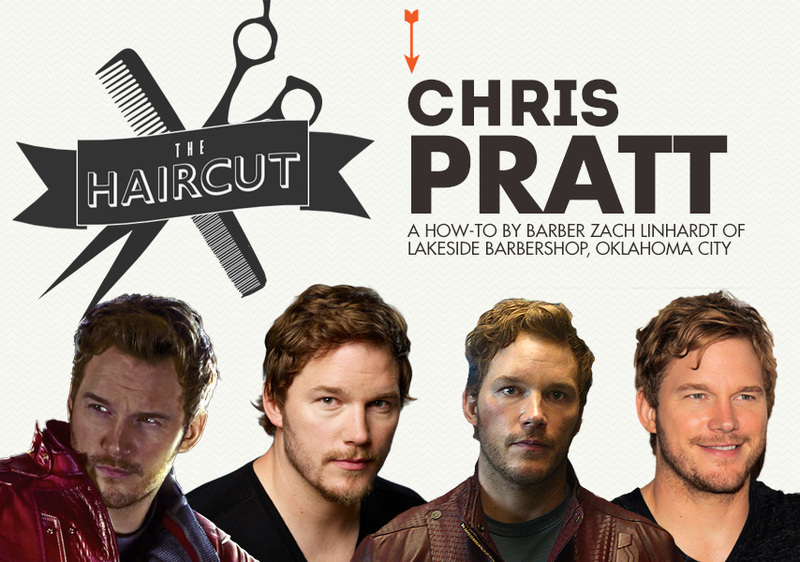 A how-to by barber Zach Linhardt of Lakeside Barbershop, Oklahoma City. This post is brought to you by NEW Old Spice hair products. For hair that gets results! We’re going to talk about Chris Pratt’s hair today. (He’s in the upcoming Guardians of the Galaxy movie as the interplanetary policeman Peter Quill.) Pratt’s style fuses several different grown-out cuts, so I’ll be doing a more thorough job of explaining my process for cutting it. This is a great style for summer. It’s so low-maintenance that you can go to the beach during the day and just use your hands to push your hair back into place for happy hour. It may be seem counter-intuitive to rock a shaggier cut in the heat, but summer is the perfect time to let go, experiment and do something a bit more playful with your hair. It’s a man’s cut, but allows you to be a bit more laid back. So let’s get down to business. First, tell your barber that you’re looking for a low-maintenance, textured style that’s a couple inches on the side and longer up top. To give your barber a better visual, tell him you’re looking for a cross between a grown out ivy league and gentlemen’s cut that’s about 2 inches or so on the sides, and 3-4 inches up top. I’d use shears for this entire cut, which gives it texture and makes it look a little more “rough” and not as clean. Texture is what gives a cut a more complex appearance (think the opposite of the slick Don Draper style). To achieve this look, the hair is not cut evenly, which creates layers. These layers are what makes the style look like it’s been several weeks since you’ve had a haircut. This is also how we’ll achieve the stray curls on the sides and shagginess in the back. There are a couple of ways your barber can create texture in your hair. They can use a straight razor and run it with the grain of your hair, which will cut random hairs shorter than others. But the simple and easy route for creating texture is to use thinning shears, the funny looking scissors with one blade that looks like an alligator’s mouth. The barber will use them to create those random layers we talked about earlier. If I were cutting your hair, I’d start at the nape of the neck and pull the hair straight out. I’d cut it at an inch and a half or two inches, and continue all the way up, gradually increasing the length. Once I got to the top, I’d comb it over to the side and, using my calibrated barber eye, judge what length would look best based on your natural hair texture. Then I’d cut and get to work achieving that messy look. Now that the cut’s just right and the barber styled it perfectly, you’re wondering, “How can I do this at home?” Since you want to keep that messy look, I’d leave the comb in the drawer and just use your hands. A comb will smooth and flatten everything out, the exact opposite of what look we want to achieve. You just need a little wax to push the top over and keep it there. Wax is the best choice for this style because it’s not going to give you the shine of pomade and has a better hold, especially in the heat. Pratt has a natural, un-shiny look; using a pomade or grooming cream will add too much wetness. Start with just a finger full of wax and rub it into your palm until it’s broken down into a consistent texture. Then lightly run your hands through your hair and “guide” the hair off to the side. Use as little product as possible – you want to leave your hair soft and unsticky enough for the ladies to run their fingers through it. If you like the look of a few stray curls or a shaggy back that’s visible from the front, use your wax-covered fingers to lightly separate and pull them into place. If you have fine or thinning hair or hair without much natural volume, the secret to beefing up the style is to blow dry first. While blowing the hair up and to the direction you want to go, use your fingers to lift the hair, starting at the root. When you’re finished, you should have a big puffy mess. Circle back to the wax method above, and gently pat and push the hair into shape, which retains the necessary volume. That’s all there is to cutting and styling this look! I’m 28 years old and was medically retired from the Marine Corps in 2011. After that, one of my good friends suggested that I go to barber school.1500 short hours later, I graduated and am on my way to taking Oklahoma City by storm – one haircut at a time! Zach, can you be my barber? I’ll fly to Oklahoma if I have to. There’s NO one I use near me! C’mon down, Jack! We’ll keep a seat open and a beer cold for ya. Haha allRIGHT. It’s a done deal. I started going to your barbershop about a year ago and then stumbled on this site. You’ve probably cut my hair, small world. This is some good stuff! My hair is super thick and super straight… could i pull this look off? Would you have any recommendations for longer haircuts with straight without looking too “bieber-ish”? Nice article… Pratt also has a lot of hair loss, receding and thinning, but his stylist hides it well. Do you think it would be difficult for someone with thinning hair to maintain this look?